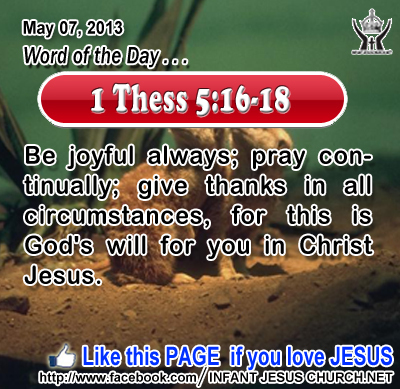 1 Thessalonians 5:16-18: Be joyful always; pray continually; give thanks in all circumstances, for this is God's will for you in Christ Jesus. Righteous Father, thank you for being there, always. Give us a deeper appreciation and a more profound awareness of your presence today in our life. May our life reflect the joy you have given us by saving us by grace. And may our heart always find its home in you. Through the name of Infant Jesus we pray. Amen. 5But now I am going to him who sent me; yet none of you asks me, `Where are you going?' 6 But because I have said these things to you, sorrow has filled your hearts. 7 Nevertheless I tell you the truth: it is to your advantage that I go away, for if I do not go away, the Counselor will not come to you; but if I go, I will send him to you. 8 And when he comes, he will convince the world concerning sin and righteousness and judgment: 9 concerning sin, because they do not believe in me; 10 concerning righteousness, because I go to the Father, and you will see me no more; 11 concerning judgment, because the ruler of this world is judged. The Spirit convinces us of the righteousness of Jesus, backed by the reality that Jesus rose again and went to his Father. The Holy Spirit also convicts us of judgment. The Spirit gives us the inner and steadfast conviction that we shall all stand before the judgment seat of God. God's verdicts are just and good. When we listen to his judgments we find true peace, joy and reconciliation with God. Do we allow the Holy Spirit free reign in our life that he may set you free from the grip of sin and set you burning with the fire of God's love? Come Holy Spirit, and let the fire of your love burn in our heart. Let us desire only what is pure, lovely, holy and good and in harmony with the will of God and give us the guts to put away all that is not pleasing in your sight.